I hear Dentists saying repeatedly that they are losing patients and that they are not getting enough new patients coming back through the door. This is not good news for any Dental Office. I mentioned a few weeks ago that it is crucial to decide which type of patients you prefer to see, and to start attracting those patients. Don’t try to be everything to everyone. 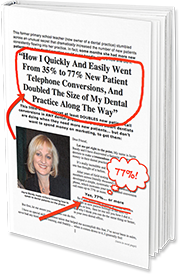 It is exhausting and less effective for your patients and your business. You need to know who you are as a Dentist and what you represent to your patients. Once you know who you are and you set yourself apart, then you will attract the right patients to your practice and keep them. Now, think carefully about setting yourself apart from others. People love something that is unique and special and meets their needs. A real Patient Experience. Always remember it is all about your patient more than it is about you. It is your patient’s experience at your practice that makes them a loyal patient. Once you know the patients you serve then you will get what they want and need and give it to them. What is the experience you provide your patients that keeps them loyal and coming back to you? The Patient Experience needs to be memorable. It starts with the simple things that cost you nothing to deliver. The key is to do them well and be consistent. Every time your patient comes in for an appointment or calls your office they should expect what you do best. Give them the experience they have grown to expect. The way you answer the phone. Every time you answer the phone, say the same greeting. Listen, listen, and listen to your patients. Ask questions, don’t interrupt or finish a sentence for your patient. Acknowledge your patient and make them feel important. Remember who they are by remembering important events in their lives. You can see these simple points of difference cost nothing to deliver to your patients. You might even say they are way too simple and you are already doing most of them. Have a check on that. It is so easy to become complacent and believe that you are giving your patients a great Patient Experience and you may not be. So give your patients a memorable and consistent experience every time they come in. It costs nothing and gives you back so much. Loyal and happy patients will never dream of going to another dentist.